This is a sponsored post on behalf of Cost Plus World Market. As always all opinions are my own. Oatmeal. Do you love it or hate it? For years I hated it and just in the past 5 month’s I’ve been working on trying to embrace it. I’ve experimented all different ways trying to spruce it up and I’ve finally come up with a flavor combo that is out of this world and make oatmeal bareable to me. 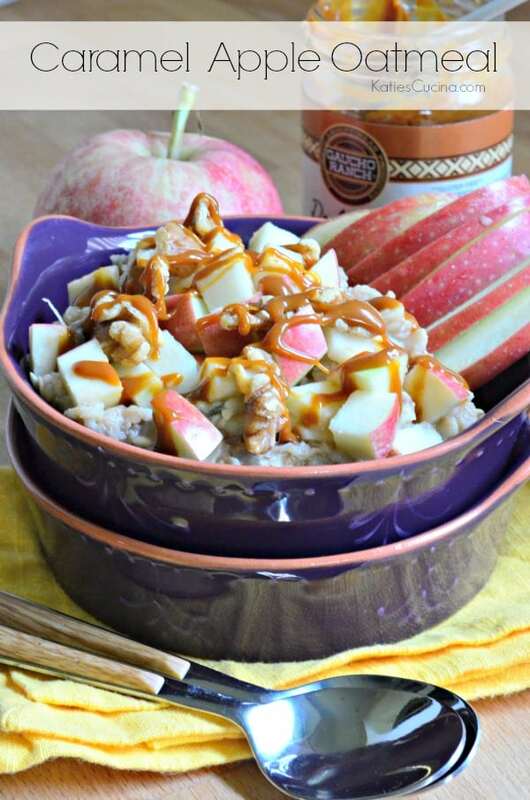 This caramel apple oatmeal is like fall harvest in a bowl for me. For those that don’t read regularly, I’m a breastfeeding mama and oatmeal is said to help produce milk production. So I’ve started bellying up to a bowl of oatmeal every morning. The things we do for our kids!??! I found that I couldn’t do the texture in oatmeal so adding crunchy fresh ingredients has helped. And of course it doesn’t hurt to add a drizzle of caramel sauce on top. 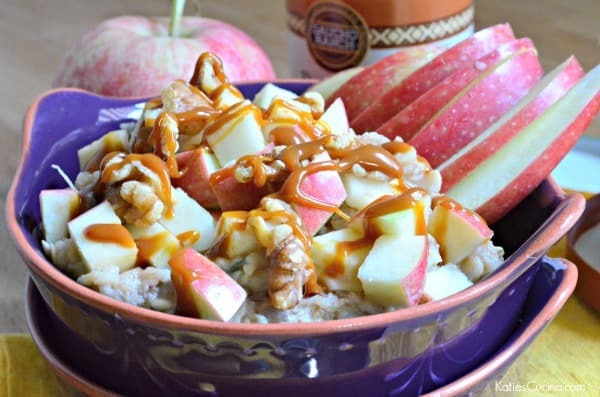 I’ve been eating this caramel apple oatmeal for the past few weeks and I can say that I feel like I’ve seen a boost in my milk supply (but then again maybe its just my mind making me think that). I found the ingredients to my Caramel Apple Oatmeal recipe at World Market. You guy’s know I love to shop there. My mom, baby Ryder, and I went a few Friday’s ago. We had a lovely lunch together to fuel up our bodies to shop! I tend to stock up my pantry when I go there from fresh pastas, oils, and a few bottles of beer. This time I stocked up on the Modern Oats Apple Walnut Instant Oatmeal. They have a wide assortment of fall food & drinks think all things pumpkin and apple! So if you aren’t fond of oatmeal I challenge you to give this recipe a try. 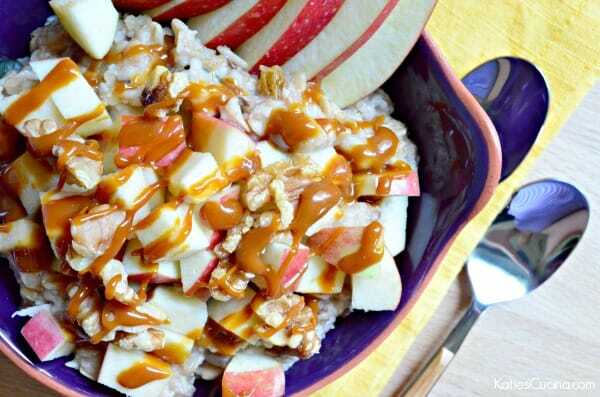 I think my Caramel Apple Oatmeal will make you start to enjoy oatmeal more like me! 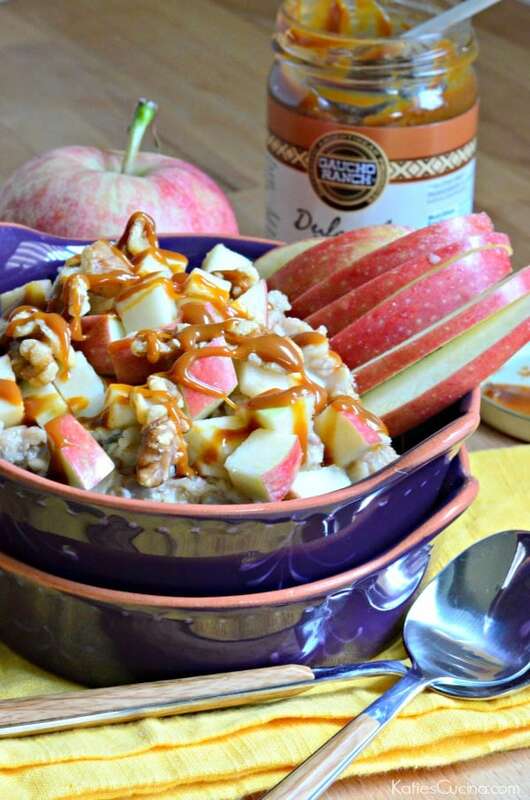 Turn breakfast into a decadent treat and make this Caramel Apple Oatmeal for one in less than 10 minutes time! Cook oatmeal according to package. While oatmeal is cooking, chop apples. Place half the apple pieces on the bottom of a bowl. Then add cooked oatmeal on top. Sprinkle half the remaining apples on top, followed by walnuts and drizzle with caramel sauce. Eat immediately and enjoy. You may need to warm the Dulce de Leche sauce in the microwave for 15 seconds to allow it to spread evenly. I’m a sucker for oatmeal; it’s my favorite breakfast… and this may be my new favorite way to make it! I’ve never liked oatmeal so this is the only way I’ve been able to stomach it. Now it’s starting to grow on me! I’m watching my carb intake. Can you provide the total carbs for this breakfast? I really think I’d love it, if it’s not to high. Hi Bridget, I’m sorry I’m not a nutrionist and can’t provide the information. Hope you’ll be able to enjoy this recipe eventually.